Whenever an adolescent doesn’t want to take responsibility, it’s very likely they’ll present themselves as a victim. When your child says, “You don’t understand me,” that’s playing the victim, because what they’re really saying is, “I’m a victim of your misunderstanding." When they say, “My teacher is mean. That’s why I didn’t do my homework,” that is victim thinking, because they’re blaming their teacher for not having completed their work. And when you hear, “I hit my sister because she stuck her tongue out at me," that is also victim thinking, because your child is using something as an excuse for breaking a rule in your household. And you’ll see excuse-making, blaming and justification all contained within this kind of thought process. In our society today, kids as well as adults have become adept at using all of these strategies to rationalize their actions. Here is where the danger lies: at the core of victim thinking is the belief that if you’re a victim of something, then the rules don’t apply to you. Here is where the danger lies: at the core of victim thinking is the belief that if you’re a victim of something, then the rules don’t apply to you. To put this another way, if you’re a victim, you’re not responsible for the results of your actions. Consequently, if you’re not responsible, then you don’t have to change anything: it’s somebody else’s fault. In our culture, if you’re a victim of a bad childhood, an accepted belief is that you’re not totally responsible for your wrongdoings. In my opinion that’s a lot of nonsense. That kind of thinking has led to the type of society that we see around us today, in which no one takes responsibility for anything and everyone is a victim of some perceived injustice. So where does this thinking come from? Well, look around you. Look at our leaders, look at our politicians. It’s never their fault; they’re always victims of something or someone. The sad truth is that victim thinking permeates our society at every level. One reason why it’s so common for teens to fall into the trap of victim thinking is because it’s part of the way they try to individuate from their parents. So, instead of seeing themselves as protected by their parents, they start to see themselves as the victim of their parents. They feel victimized by household rules, limits and expectations from their parents. If you think of it from your child’s perspective, adolescence is probably the most conflicted age that a person can go through. Teens and pre-teens are filled with intense emotions. They are undergoing hormonal, physical and sexual changes. When they get to junior high and high school, they are handling more responsibility than they ever had in grade school. Don’t forget that the 16-year-old who has access to money and cars and drugs was a 12-year-old four years ago. As parents, it’s important to remember how quickly this happens. This does not mean that children shouldn’t be held responsible for their actions, though—far from it. In fact, I think parents need to be more aware of the natural propensity of teens to use victim thinking, and that you should challenge it as often as possible. It’s not unusual for kids to feel very comfortable in their identity as a victim. When you challenge that stance, your child might see you as being a little weird and out-of-touch. He might say, “You just don’t understand me,” when you don’t buy into the victim thing. And by the way, most parents do buy into it. 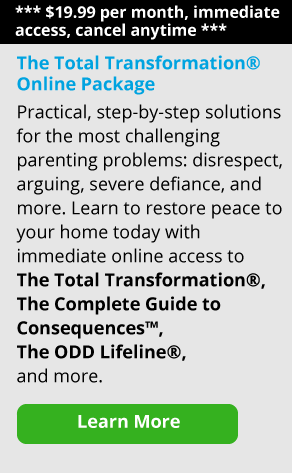 Many develop a parenting style where they believe their kids are victims, and then they try to fix things for them. But in my experience, this creates a very difficult situation for the family. When your child says, “You don’t understand me," he’s inviting you to a fight. Don’t fight that fight. All you have to say is, “Well, maybe I don’t understand you. But I do understand this: you have to do your homework and there will be no electronics until you get it done." Another thing you can say is, “Maybe I don’t understand you, but it’s important that you understand what I expect you to do." Don’t argue with your child or get sidetracked into fights about who understands whom, or who loves whom. Be firm and don’t let yourself get pulled into that. Victim thinking is actually part of a broader range of what we call “thinking errors". There are errors in thinking just like there are errors in math and spelling. Someone may spell a word or solve a math problem a certain way and get the wrong answer. But while they’re doing it, they believe it’s right. In the same way, people use thinking errors and get the wrong answer to life. The sad part is, while they’re doing it they think it’s the right answer. Some of the thinking errors adolescents use are dishonesty, justification, making excuses, blaming others, and playing the victim. And so you’ll see adolescents using victim thinking within this whole constellation of thinking errors. And they use it to avoid taking responsibility for things they’ve done or things they don’t want to do. For the most part, adolescents believe what they’re thinking; it’s not a manipulation. When your child plays the victim, makes excuses or justifies himself, he believes what he’s thinking and saying is true. That does not mean that you shouldn’t hold him responsible for his actions—and I mean hold him responsible sternly and clearly. I believe allowing your child to use thinking errors in order to avoid taking responsiblity is a very dangerous thing, because it will not prepare him for adult life and decision-making. I believe parents should develop what I call a “culture of accountability” in their home. This means that whatever is going on in the outside world, in your home there is a culture of accountability—and not a culture of thinking errors. So blaming, excuses, justifying, and being the victim should have no place in the realm of doing your chores, treating other people appropriately, doing your homework and taking care of your responsibilities. It means that your child is accountable in your home for all of those things. Part of establishing a culture of accountability is being very clear as a parent about what your values are with your kids. Then, you have to live those values. So if you value taking responsibility, not only do you have to be clear about that, you have to take your responsibilities seriously, and then you have to demand it from your children. As I’ve said before, if you value honesty, don’t lie. If you value trust, be up front about the things you do. And tell your kids, “These are the things we value and this is the way we’re going to live in this home." Your child is exposed to thousands of things in the outside world, but when he comes home, he’s accountable to your values. You hold him accountable by setting limits, rewarding responsibility-taking, and giving consequences for making excuses. You also teach him accountability through discussions about behavior and conversations about how to do things differently "next time it happens." Remember, in your home, your child is accountable to you. You: “Your teacher emailed me and said you haven’t handed in your homework all week." Challenge the thinking error right at its source. That’s part of what I teach parents to do in The Total Transformation Program. It’s important to confront victim thinking in our children if we don’t want thinking errors to become a way of life. A few years ago, there was a very in-depth study done on criminals in the California prison system. One of the important things it showed was that people who return to prison repeatedly see themselves as victims: victims of poor childhoods, of society, of poor parenting, of poverty. And what happens is, as long as they see themselves as victims, they don’t feel as if they have to take responsibility to change their antisocial behavior. When you’re a victim you can always find a way to be a victim. If you’re the parent of teenagers, you know that many of them find a way to think of themselves as victims much of the time. Remember, although your child is going to develop thinking errors automatically, it’s up to us as parents to challenge that victim thinking and hold our children accountable.